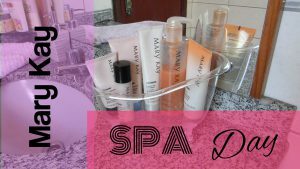 You Won a Mary Kay “Spa Day”! Here’s my story of how I won an “exclusive spa day” that haunted me for 3 years. When I was planning my wedding, I was alone. I was in a new state, so none of my friends or family were around. I went to my first bridal event by myself, and entered all the contests. We didn’t have a lot of money and were paying for everything ourselves, so any free thing I could get, I was there trying for it. Walk into the event and there are primly dressed business women, proudly displaying MK name badges, ushering in other poor women like me into a room. I’m immediately embarrassed. I apologized to my mom over and over and over again. Why did I think I “won” anything? Of course I didn’t win anything. I was alone in a new state with my new fiance, no female friends around, new on the path to a serious commitment…of course luck wouldn’t go my way. My self-esteem plummeted. I was already on the verge of depression. This started to kick me over. But my mom put on a brave smile and said, “Oh, I used to buy MK. Maybe they still make that eye make-up remover.” It didn’t make me feel any better, but I put on a brave face. We were already here. We drove 30 minutes for a “spa day,” so damn it, we were going to be pampered. There was no pampering. They can’t actually touch you. They aren’t licensed. You have to do it all yourself. I didn’t wear makeup at the time, so most of the products didn’t appeal to me. I won’t forget how they ushered us in a line like school children towards the hotel bathroom to rinse off the hand scrub so we could “feel the difference!” I felt the difference alright. That water was cold, and we had to be very quick, because there were 30 other women behind us who needed to use this restroom. At the end of the “spa treatment,” I was so desperate to salvage the day that I asked my mom to buy me the kit. “Are you sure,” she asked. “Yes. I want this. I want the kit.” I figured maybe I would make new friends. I was alone. I was suckered into this. Might as well go the full nine yards. Plus, I could receive a skin care kit for free, on the spot, from the director in the pink car! So I was signed up. The exchange was quick. The director acted really jittery, trying to hurry through me to the next woman behind me, but I figured she was just busy…it’d be nicer on our first home meeting. She came to my house on a bad day. I had just received news from my bank that due to a decision I had made regarding my accounts and a clause they didn’t disclose to me beforehand, I had locked $600 of my money for 30 days away where I couldn’t touch it. It was my rent money. I was in tears. I was hysterical. My fiance was at work, and I didn’t want to panic him. I was in school working on an assistantship, and that pretty much paid the gas that I used to drive the 1.5 hours to get to and from school, 3 hours a day total just driving. The director (honestly I don’t even remember her name) arrived at my apartment way too chipper for me. I tried to hold it together for a total of 1 minute before I burst into tears. She immediately came to my side of the sofa and put a comforting arm around me. “It’s okay,” she said. “God doesn’t put us through situations we can’t handle.” Having grown up in a bible-thumping state and NOT being a bible-thumper myself, I just smiled uncomfortably and resolved to continue through the meeting. She drove all this way, and I’d rather not have an impromptu prayer session with a stranger. So of course she makes sure I’m no longer crying, pulls out all the pamphlets and catalogs, and tells me to get a credit card so I could afford at least $2000 in stock. I was in shock. I just told this woman I couldn’t even get the $600 that I ALREADY HAD to pay my rent, and she wanted me to go in debt with a new credit card that I was 100% positive I wouldn’t be approved for anyway? What was wrong with this woman? Again, she was extremely jittery and acted like she was on cocaine. I’m not exaggerating. I’ve seen people on this drug, and she acted very much like an addict. I thought, maybe that’s just her personality? To this day, I have no idea. She was like that every time I talked to her, and it made me very uncomfortable. I thanked her nicely and got her the hell out of my living room as quickly as I could with promises to buy what I could. I already knew then I had made a terrible mistake. She never visited again, but she did call. For 2 years. I received my kit. I tried to sell the items. I already regretted buying into this, but I already had the product. It was also my mom’s money, so I felt I had to try my best to not waste her investment. But $32 for an eye cream? No one wanted that. At most I could sell a $14 lipstick to a neighbor. So I would place the order, with way more product than I had just sold just to meet the minimum and make the shipping worth it, to give my neighbor a product that didn’t even PAY for my shipping cost. A year later, I moved back to be near my family with my fiance. Money was too tight. We postponed the wedding another year. I told people I sold MK, but I stopped answering my director’s phone calls. I did the social media thing, but there were no bites, and honestly my self-esteem was just eating it all. Every time I didn’t sell something, it took a hit. Every new product I purchased that sat in my cabinet, every time I had to lie to my fiance about how much money I wasted, I hated myself just that much more. Every month the director would send out mass text messages pleading with her downline to reach a goal so that she could reach HER goal. Promising that if we placed just $200 in orders, she would MATCH that amount in free product. I couldn’t sell even $50. No one wanted it. Everyone had a consultant already. Anyone who wasn’t suckered into it already knew that it was a scheme to be suckered into. I wanted out. Now. Before it got worse. Before my soon-to-be-husband started to notice that I wasn’t selling any of the product I bought every month. By the time the wedding was a month away, I decided I was done with it and blocked my director’s number. How do I quit? I researched. I decided to let my contract die. Turns out it takes time to let it die on it’s own. It was 3 years ago and I don’t remember now, but I think I received e-mails from them for at least a year before they finally left me alone. I didn’t try to sell my product back to the company. I gave it away for Christmas gifts. I found a buyer on Craigslist who bought about $200 worth of items, including the MK bag the starter kit came with, for $40. She was also giving them away as Christmas gifts. I will never buy MK again. I don’t want them to have my contact information. Oh, and that original “spa day” that I won? That booth said NOTHING about Mary Kay at it. Not.a.damn.thing. Can You Make a Living Selling Mary Kay Products? They don’t openly say they’re withK because they know women will scoff at them and run away. I have a friend that was approached in a tesstaurant for a “customer appreciation day” and gave her contact info to be entered to win something. Turns out it was an MK lady that badgered her non-stop to try to get her to book with her. Had my friend seen ANYTHING showing the lady was with MK, she wouldn’t have entered. I started to see the fall of our reputation and the lower quality customers that we were attracting, and I then started my maneuver out. I guess they’ve reached a new low. When I joined years ago my SD’s annual bridal scam held the MK products and you knew it was them. One bride actually booked her wedding day. I had only been with MK for 3 weeks with NO glamor training. I was terrified of ruining the bride’s special day. I told my SD that if she didn’t show up, I would quit. I was doing the facials of 4 women for about 40 minutes (slowing it down). Finally my SD showed up and did most of the glamor. After years of being with MK her glamor skills were atrocious. I stuck around because of the friendships of the other women. I even took a fake glamor course with a former make up artist and MK director. Her training was horrible. My husband could never understand how with the supposed training I still felt untrained. Even my director’s meetings, career conference, the visits from NSD’s, an out of state visit with my NSD, seminar, the MK training was virtually non existent. It was a bunch of rah, rah, and fake tales of rags to riches. That was years ago. I booked a few classes where I got pity purchases. I found a few women who already bought products. I listened to the Faith First, Family 2nd, Career third BS and soon learned by NSD and SD were horrible narcissistic predators. They would convince a woman to spend her grocery money to buy a starter kit. I felt ashamed. Finally I quit and sent my products back. Months later I was still fixated on Mk and wanted to rejoin. Thank goodness I couldn’t. My husband and family hated MK. It was only years later that I began to realize the time I wasted away from my children on this mlm scam. Thank goodness for PT and the internet. Now women can research and find out that this organization have misled hundreds of women for decades. I was embarrassed schlepping around products from my car house to house. I was never comfortable doing make overs or promoting this organization to others. The best thing I ever did was return product and start a brand new career. A career that paid a great salary with benefits. Hundreds? More like hundreds of thousands to millions of women hurt by this scam! Now that makes me mad. Why even let brides book w/you in their wedding day? Yeah MK is a disgusting organization and their products are pure garbage. They really take advantage of innocent people which is a shame! Don’t understand how it was salvaged by letting your mom buy you the kit? I think maybe she was trying to make something out of it… maybe make lemonade out of lemons by becoming a consultant and turning this into an opportunity for herself. I am so sorry you went through this. I sell Mary Kay and I would NEVER do that. I always tell people I am from Mary Kay and I would NEVER have someone drive to me unless we were using my studio and it was convenient for them. I also would never have HUNDREDS of women show up to a “spa” day in a hotel. I am sorry. It sounds like you ended up with someone who was in desperate need to keep their pink car and director status. A single honest consultant can not make a corrupt company ethical. A hundred honest consultants can not make a corrupt company ethical. The only thing you’re really doing is putting a pretty slipcover on a rotten core. Why? What do you gain by being part of the pretty slipcover? You would never do that, Suzzi, but there’s plenty of proof that many, many other MK consultants, directors and NSDs will and have done manipulative things just like that. You’ve seen it for yourself. If you think you haven’t, just pay close attention at your Mary Kay meetings. The manipulation and corruption is right there to see, when you know to watch for it. What do you have to gain by affiliating yourself with the wrongness? Yes, just like hundreds, if not thousands, of directors that use the same deceitful tactics because they too are in desperate need to keep their pink car and director status. The desperate need is a product of brainwashing and induced phobias.